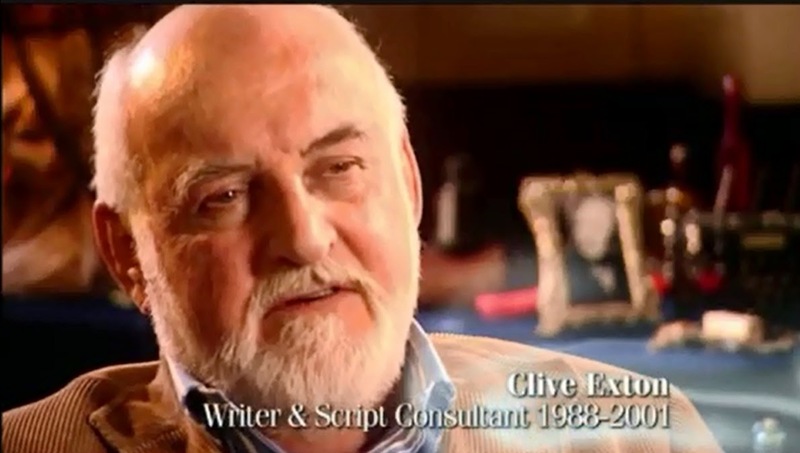 In total, Exton wrote 20 scripts for Poirot (1989-2001). I won't go into detail about every adaptation (have a look at my episode-by-episode posts for that), but I would like to give an overview of his adaptations, and comment on a few of them. Personally, I think Exton made the right decision. ITV intended Poirot to become its Sunday night drama 'flagship'. To make people tune in week after week, there had to be something more than just Christie's murder plots to make the nation (and later the world) tune in. His approach to the main cast, 'the big four', also seemed in tune with the short stories on which the early adaptations were based. Christie's short stories are generally much lighter than her novels. Personally, I'm also convinced that Exton and the Poirot team, like Christie, were inspired by the successful Jeremy Brett Sherlock Holmes series, in which the detective is surrounded by Watson, Mrs Hudson and Inspector Lestrade. For Series Two, Exton did Peril at End House, 'The Veiled Lady', 'The Cornish Mystery', 'Double Sin', 'The Kidnapped Prime Minister' and 'The Adventure of the Western Star'. After the success of the first series, the Poirot team had decided to make some changes. Most importantly, Suchet wanted to make Poirot more human. He explains the process: 'Clive Exton's script certainly helped me. For he too wanted a little more humour in the new series, to make Poirot a bit more moving. It was an excellent idea, even if I sometimes had to restrain him from going too far towards making the little Belgian a comic character, for that certainly was not the Poirot I knew and wanted to portray. But at the same time, Clive also brightened both Hastings and Japp, making them a little less stiff. All this helped to make the films feel more affectionate towards Poirot than some of the first series. (Poirot and Me 2013 p. 77). I suppose nearly all of the above episodes had more humour in them, from Poirot in disguise to the Belgian film star Marie Marvelle. Generally speaking, Exton's scripts are faithful, but some of the additions (or time slot filler) doesn't always work. Suchet admits: 'I'm afraid I was never really happy with Double Sin, The Adventure of the Cheap Flat and The Adventure of the Western Star. They all seemed a little flat to me, a little too one-dimensional compared to the others.' (p. 84-85). However, Exton's adaptation of Peril at End House works particularly well, and I notice that it has a tendency to pop up on people's lists of their favourite episodes. For Series Three, Exton adapted only two episodes; The Mysterious Affair at Styles, and 'The Theft of the Royal Ruby' (co-written with Anthony Horowitz). The Styles adaptation is near-perfect, with very understandable changes and a genuine respect for the source material. The same could (almost) be said of 'The Theft of the Royal Ruby', but here we have another of those slightly annoying chase scenes added. The two novel adaptations that followed for Series Four are interesting, in more ways than one. Both mark a significant shift towards darker material and darker adaptations that would eventually take over from the cosy family unit. The ABC Murders is a particularly successful adaptation (though, again, with an added chase scene at the denouement); Suchet frequently refers to it as his personal favourite. The serial killer plot, and particularly the way Exton adapts it to the screen, significantly darkens the series. The second novel, One, Two, Buckle My Shoe, opens with a particularly brutal murder scene and has an eerier atmosphere throughout. For those who claim Exton was stuck in his family unit, then, his Series Four adaptations should prove essential viewing. Likewise for those who claim the shift towards darkness in Series Nine was sudden. For Series Five, Exton adapted 'The Adventure of the Egyptian Tomb' and 'The Adventure of the Italian Nobleman'. Both adaptations work, particularly the first, but I think that is more due to its setting than its plot. The second is, yet again, weakened by a lengthy chase scene. Why Exton insisted on adding these scenes I will never understand. Obviously, they are perfect padding to slight stories, but they do seem more and more as an 'easy' way out. He makes up for this in his adaptation for Series Six, though. Hercule Poirot's Christmas is classic Christie, and the adaptation is generally quite successful. When Poirot returned after its four-year hiatus for Series Seven, Exton seemed to have lost his way somewhat. The Murder of Roger Ackroyd has some interesting points in its favour (for instance, I'm very fond of the opening lines from Poirot on the brutality of humanity), but the denouement doesn't work at all, and I'm not convinced the voice-over was the best way to keep Christie's ingenious twist. Suchet says of the episode: 'I felt it lacked something. I am not sure exactly why; perhaps it had something to do with my expectations being too high. The denouement was exciting and unexpected - it should have been marvellous, but somehow, there was something missing.' (Poirot and Me p. 187). Unfortunately, Murder in Mesopotamia for Series Eight is another questionable endeavour. The addition of Hastings feels contrived, and the story itself seems as though it has run out of steam. In summation, then, how could I describe Exton's legacy? Despite his tendency to use chase scenes as padding, and his sometimes contrived attempts at keeping 'the unit', I remain convinced he was the right man for the job when the series began. For one, he was a Christie fan, and handled her most 'classic' stories with great care. More importantly, to establish the family unit was an ingenious move; I'm sure that helped establish Agatha Christie's Poirot as the phenomenon it is today (Hastings, Miss Lemon and Japp have almost become cult figures!). It certainly changed along with the TV shows surrounding it, i do tihnk it lost something in the transistion to the darker episodes.